A total of nine lohans, or Buddhist worthies also known as arhats, appear in the left and right scrolls with two attendants, making for a pair of paintings with eighteen lohans, a traditional number. The lohans hold various objects, such as a scroll, flywhisk, prayer beads, lotus, and incense burner. In various exotic forms, both old and young lohans are shown. Some appear to be Indian with deep-set eyes, prominent noses, and darker skin, while others are Chinese with slender eyebrows and lighter skin. The drapery lines are condensed and the brushwork varied, at times even and lingering with a fluid and flowing manner. At other times, it is hesitant and twisting, forceful and vigorous. The facial features and hair of the figures are rendered with delicate strokes, and even the refined details of the drapery patterns are fully expressed. Although bearing no seal or signature of the artist, the rendering throughout is precise and exacting, the coloring beautiful but not overbearing to create a pure and elegantly otherworldly effect. 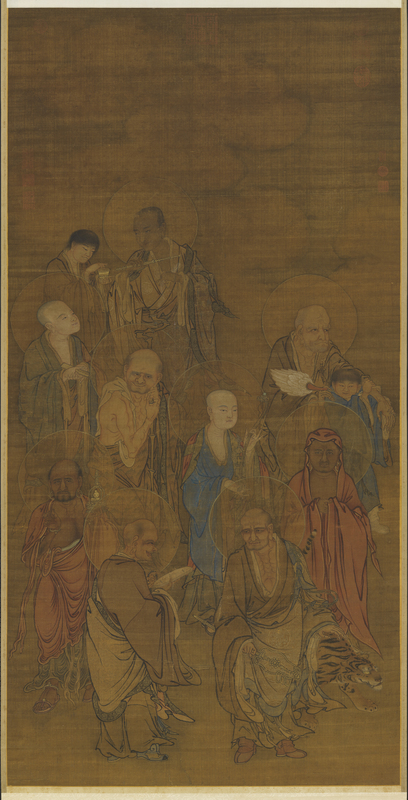 The pair of scrolls serves as a superb example of Yuan dynasty religious painting.